TapeDeck. ▸▸ The tape recorder…fast-forwarded to OS X.
TapeDeck is a powerful and fun audio recorder for OS X.
It’s just like your old analog tape recorder, only better. A lot better. You're always one click (or keystroke) away from a new recording, and your tape is automatically saved when you hit STOP. Using the Apple Lossless Audio Codec, TapeDeck can capture your tapes with full fidelity, so you can ensure your musical ideas are kept intact when moved to Garage Band, or Logic. 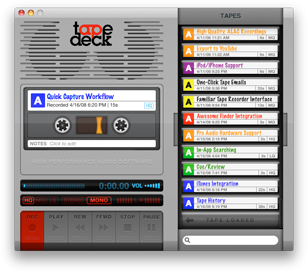 The TapeDeck UI is chock-full of animations and sound effects. You'll find yourself clicking REC just to watch the tape spin! Send tapes to iTunes for listening on your iPod or tv. Share them with friends by email. So much more convenient than plastic audiocassettes. 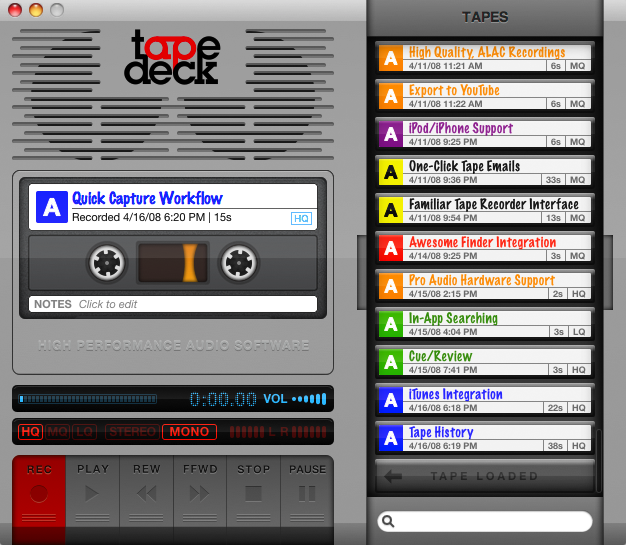 Everything you've ever recorded with TapeDeck is available, in chronological order, in your tape box. Quickly search tapes by title, color, date, and quality, using the search field. The Retina Display on your MacBook Pro now makes this beautiful application look even better. See for yourself. Record using microphones and instruments that are attached to channels other than 1 & 2. Now you'll never have to load your DAW to capture a quick riff, or song idea! Press REW in the middle of playback to review what you just heard. FFWD to skip ahead, complete with sped-up audio. ALVIN! Share your tapes with the world in one easy step. TapeDeck will create an animated HD movie of your tapes and ship them off to YouTube for you. Check out a sample video. Listen to the tapes and LPs you're recording, while you're recording them. Dust off your favorite hair band hits, and get to digitizing your favorite old albums! Label your practice sessions. Take notes during lecture. Catalog your amplifier and pedal settings. It's all full-text searchable. TapeDeck requires a Mac with OS X version 10.8 or later. Get in touch by visiting our support tender or emailing us. You can even Like us on Facebook!